Restoration of a watershed returns the ecosystem to as close an approximation as possible of its state prior to a specific incident or period of deterioration. If a watershed has deteriorated abruptly due to a sewage spill, restoration may consist of only a few procedures. When deterioration of a watershed occurs gradually, however, restoration can require rigorous scientific protocols and involve lengthy, complicated, and costly operations. The restorative process includes the remediation of the water quality, repairing the source of the water damage, and repopulating the watershed with plant and animal species. In some cases, it is sufficient to make the restored habitat attractive to native species and to allow natural repopulation. Restoration can be divided into two broad categories—reestablishment and rehabilitation. Reestablishment is the alteration of the various characteristics of a watershed in order to restore the site's former function. Reestablishment can involve construction to rebuild physical parts of the watershed. Often, reestablishment results in the enlargement of the total area of the watershed, as acreage that has fallen into disuse is reutilized to restore the former dimensions of the watershed. Rehabilitation seeks to repair the watershed, not necessarily to restore its original function. Correcting the damage from a sewage or chemical spill, for example, is considered watershed rehabilitation. The rehabilitated portion of the watershed does not necessarily function at its previous optimum level. Nonetheless, the short-term damage has been repaired. The primary goal of a watershed restoration effort, utilizing scientific principles and technical skills, is to restore the ability of the ecosystem to function. 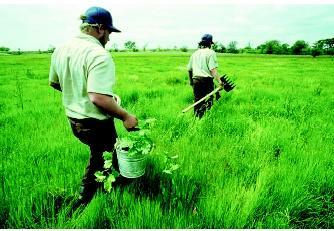 Restoring native vegetation is one step in watershed restoration. Here two members of the California Conservation Corps plant valley oaks to help return cropland back to wetland in Sacramento County's Stone Lake National Wildlife Refuge. This can be a complicated aim, because an ecosystem has a myriad of interactions. These include interactions between the watershed's inhabitants, water level and flow, nutrient cycling, and the inevitable, natural changes that occur over time that change ecosystem dynamics (e.g., soil erosion and replacement). The interest in restoring watersheds is increasing as the realization grows of their importance to the health of the species that are part of the ecosystem and to the communities that depend on the watershed for their drinking water. For example, the federal government of the United States has committed to improve or restore 100,000 acres of wetlands each year and 40,000 kilometers (25,000 miles) of stream shoreline. Watershed restoration is important, not only for the benefit of the species living in the area, but also for those who will use the water that emerges from the watershed. Restoration efforts in one part of a watershed must consider the needs of the entire watershed. Changes in one area may cause undesirable effects both upstream and downstream. A broad view is necessary, therefore, to remediate even a localized problem in a watershed. Remediation of a watershed will help only temporarily unless the underlying cause of the deterioration is addressed and remedied. Thus, a critical part of the process is to establish what exactly went awry. For example, damming of a river is an alteration that, in some cases, can be partially or entirely reversed, either by modifying the dam or removing it altogether. In cases of chemical contamination, a chronic (long-term) ongoing leakage of sewage or acute (short-term) spillage of industrial waste also can be corrected. Other causes of watershed deterioration, such as toxic elements leaching from underlying rocks, cannot be corrected, although mitigation measures can be taken to protect public health (e.g., in the case of arsenic in groundwater). Identifying the problem and attempting to restore the watershed by eliminating the problem represents one approach. The hope is that time and geological processes will effect a natural repair of the ecosystem. Most often, scientists recommend the passive approach over active intervention(i.e., bulldozing, replanting, draining), even though the changes take longer to occur. Active intervention is not a natural process, and as such may not produce changes that persist. In addition, active intervention may cause or contribute to adverse side effects. Similarly, restoration utilizes native plant and animal species and avoids the introduction of species not native to the region. In many places around the world, the introduction of a nonindigenous (non-native) species has proved invasive. The foreign species, which may not have any competition or natural enemies, can grow explosively and out-compete the native species. The fast-growing kudzu plant, for example, was planted in the southeastern United States during the 1930s as a means to prevent soil erosion. Native to China and Japan, and without its natural controls, the kudzu proved hardier than expected and by 2002, kudzu occupied an estimated two million acres of forest and watershed land in the United States. Kudzu can grow up to 0.3 meters (1 foot) per day, and densely covers trees and other vegetation, eventually causing their death from lack of sunlight. Kudzu eradication efforts remain an ongoing concern in southern states. Watershed restoration often uses bioengineering techniques. Bioengineering combines living plants with dead plants or nonliving material to produce a living system that resists erosion. Selective planting on a hillside by a shoreline is an example of bioengineering. When properly completed, the bioengineered solution can produce an environment that stabilizes the land, controls flooding and even takes part in the treatment of water. Planting certain species of plants to produce a marshland is one bioengineering solution to watershed restoration. Marshlands function as efficient filters of polluted water as the water slowly percolates through the marsh. Marshes also act as a buffer between the various parts of the ecosystem. Similarly, other types of buffers can help protect watersheds from deterioration. An example is the riparian zone, which is the zone of vegetation that lies immediately adjacent to a watercourse. If the riparian zone has been lost over time, the stream or river can be vulnerable to surface runoff, erosion, and flooding. Reestablishment of a riparian zone can produce the buffer that mediates the effects of the surrounding land on the quality of the stream or river. SEE ALSO Ecology, Fresh-Water ; Erosion and Sedimentation ; Forest Hydrology ; Lake Health, Assessing ; Land Use and Water Quality ; Stream Health, Assessing ; Wetlands. National Research Council. Restoration of Aquatic Ecosystems: Science, Technology and Public Policy. Washington, D.C.: National Academy Press, 1992. United States Environmental Protection Agency Office of Water. Principles for the Ecological Restoration of Aquatic Resources. Washington, D.C.: USEPA, 2000. "Restoring the Nation's Living Marine Resource Habitats." NOAA Restoration Center. <http://www.nmfs.noaa.gov/habitat/restoration/> . What is Restoration? United States Environmental Protection Agency. <http://www.epa.gov.owow/wetlands/restore/defs.html> . In my tiny area, I want to rehabilitate some degraded maountain forests , but My research advisor ask me the the place under study should be imaged by satelite and spatio-temporal dynamics of forest clearance shoulbe shown . However , GIS software is very expensive and satelite image too. How can you help me sir ? If possible send your hand Please.